Ensign Kadmar Patel is a security officer serving on Outpost 112. He is a former Borg drone who was assimilated at Sector 001. Patel has very few memories before being assimilated, as his mind was wiped during the assimilation process. A few years after the Battle of Sector 001, Patel was found by a Federation Starship on a deserted planted in the Alpha Quadrant as a Borg. He was injured and stuck in a pit, and it was thought that he was abandoned by the Collective. Having the Borg link severed, Patel was rehabilited back to his former self, although his body was left heavily damaged and scarred. He has several remaining borg implants on his body, including his face. His memory never fully recovered from the assimilation, but his basic cognative thought was deemed in perfect working order. Once discharged, Patel took a year to himself in order to reconnect with his family. However, he had difficult couping and adapting to a life that felt foreign to him. In 2382, Patel joined Starfleet in order to gain a sense of purpose, and a new outlook on life. Patel is a relatively bitter young man. 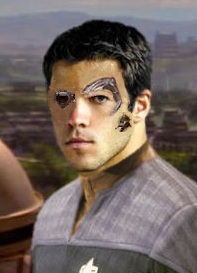 He has self-image issues and a strong hatred for the Borg. He often times seems unapproachable by others. He has a Borg monocle over his right eye, which makes him a crack-shot with a phaser.